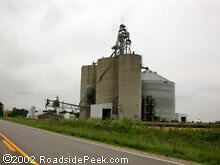 The two lane highway of Route 66 brings you to sights such as this mill. The calmness of the Mother Road is a fine escape from the Interstate. 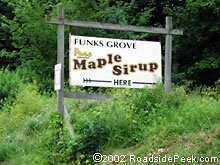 This brings us up to a Route 66 treasure .Established off the Mother Road in the early 20's, Funks Grove Maple Sirup (below) has been a delightful Route 66 stop for many years. 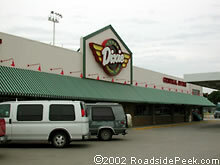 A legend of the Mother Road, the Dixie Truckers Home in McLean, IL has been open every day, with the exception of a day that was lost due to fire, since the late 1920's. Today, the Dixie lives up to its name by continuing to serve all travelers, especially truckers. 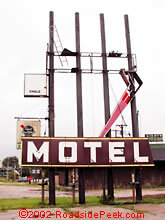 Here's an old motel marquee that lost its sign long ago. 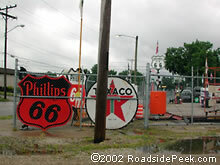 Off Route 66, there are many businesses that proudly display their old gas station and old 66 memorabilia proudly, such as this one in Springfield, IL. 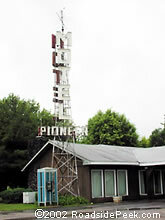 The Pioneer Motel is one of the Route 66 motels that still feature its old marquee proudly off the main highway. With a name like the Bel Aire Manor, you would expect all the luxuries and grandeur of the finest hotel, with the convenience of a roadside luxo lodge. 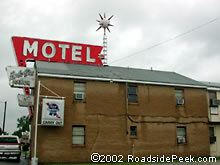 Not sure if this motel fits the bill, but at least its still in business. A business that still survives, off Route 66 in Springfield. 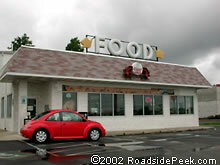 Here's a Steak n' Shake that feeds off the old road in Springfield. Not quite the external treasure of other Steak n' Shakes, but the food is still great. Here's the world famous Cozy Dogs drive-in in Springfield. This is a must stop for a bunch of dogs and back in 2000, was run by Buz Waldmire, son of Route 66 legend and Cozy Dog founder Ed Waldmire, and brother of Route 66 artist Bob Waldmire. The Cozy Dog Drive-in is now owned by Sue Waldmire. 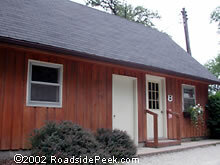 Again, don't forget to stop in for a visit! 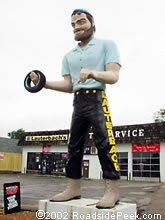 Here's a roadside tire man standing with a mischievous grin outside of Lauterbach's Tire in Springfield. If you're in the West, the name In n' Out will bring a healthy grin to your face, especially with an empty tummy. 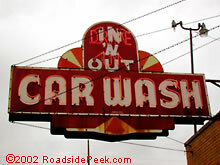 Well, here in Springfield, the In n' Out Car Wash still operates, even on cloudy days. 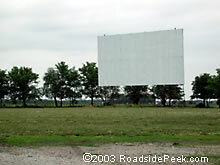 A bit further out of town is the Green Meadows Drive-in Theatre. This theatre is closed, with a go-kart racing track in its place.